US ISM Manufacturing PMI, Rate decision in Australia, the UK and the Eurozone, Important employment events in Canada and the US including the important NFP release. These are Forex Market Movers This Week. Check out these events on our weekly outlook. 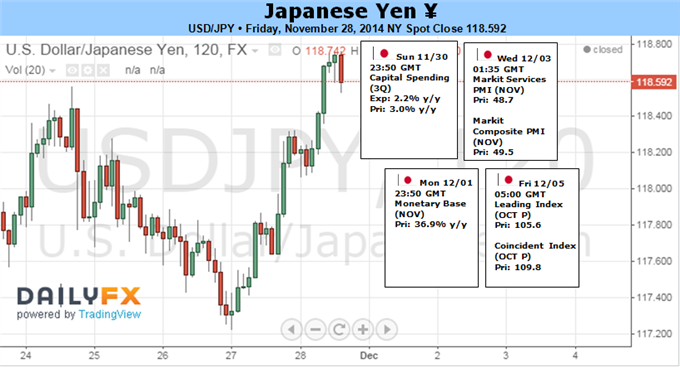 Last week, US data showed mixed results. Durable goods orders advanced unexpectedly 0.4% but missed on the core, posting 0.9% decline. Jobless claims disappointed crossing the 300,000 line for the first time in nearly three months with a 21,000 jump to 313,000. New Home Sales rose for the third straight month to a seasonally adjusted annual rate of 458,000 units but missed forecast for a higher gain of 471,000 units. Nevertheless, the second GDP release came out better than the first estimate, showing a 3.9% growth rate in the third quarter reflecting upward revisions to business and consumer spending, as well as to inventories. Due to the flood of US economic data released at once before Thanksgiving, volatility tends to be higher. Will the US data continue to show resilience? US ISM Manufacturing PMI: Monday, 15:00. US manufacturing PMI came in at 59.0 in October following 56.6 in the prior month. The release was higher than the 56.5 forecasted, contradicting the US manufacturing PMI from Markit Economics report showing manufacturing activity slowed to its lowest since July. Economists expect manufacturing PMI will reach 57.9 this time. Australian rate decision: Tuesday, 3:30. Australia’s central bank kept the cash rate at 2.5% in November, noting that rates will remain unchanged in the coming months and that currency remains overvalued. Governor Glenn Stevens has seeks to stimulate domestic growth drivers to boost economic growth. The RBA’s The growth outlook was less optimistic than in the previous report, but with diminished worries about the housing market. No change in rates is forecasted. Australia GDP: Wednesday, 0:30. The Australian economy expanded a seasonally-adjusted 0.5% in the second quarter after 1.1% growth registered in the first quarter. The release was better than the 0.4% rise forecasted by analysts. On an annual basis, GDP grew 3.1%, lower than the 3.4% recorded in Q1. Exports fell 0.9% compared to a 4.2% gain in the first quarter, while imports edged up to a 3.7% expansion from a 1.2% decline in the first quarter. Economists expect an annual growth of 3.0% in 2014, and a 2.8% gain in 2015. The third quarter GDP is predicted to be 0.7%. US ADP Non-Farm Employment Change: Wednesday, 13:15. The US labor market continued to strengthen in October, registering a pick-up of 230,000 in private sector hiring, after a 225,000 gain in the previous month. However the third quarter slowdown is expected to continue towards the end of 2014 which could badly affect the job market. A gain of 223,000 jobs is expected in November. Canadian rate decision: Wednesday: 15:00. Stephen Poloz head of the BOC decided to maintain borrowing costs due to sluggish growth of global economy. Poloz noted that rates could go up or down, depending on economic headwinds from the global economy. However, most economists expect the next rate move will be up, and that it will likely come by mid-2015. Overnight rate is expected to remain unchanged. US ISM Non-Manufacturing PMI: Wednesday: 15:00. US service-sector growth slowed in October to 57.1 from 58.6 in September. The index has been declining since July reaching its slowest pace of growth in 6 months. Nevertheless, the index is above 50 indicating growth. New business expanded in October, a good sign for economic growth. Employment remained strong, but business outlook was more pessimistic. US service-sector is expected to reach 57.5. UK rate decision: Thursday, 12:00. Bank of England voting members decided to keep interest rates at 0.5% in November. The stimulus program remained unchanged at £375 billion. Economists expected a rate hike in November, after Mark Carney, the Governor of the Bank of England noted the decision surrounding the timing of the first rate hike was “becoming more balanced” and “could happen sooner than markets expect”. The Official Bank Rate is predicted to remain unchanged this time. Eurozone rate decision: Thursday, 12:45. Mr. Draghi, the president of the European Central Bank, promised in October that more aggressive measures are being prepared, in the form of the large-scale bond purchases known as quantitative easing to boost growth in the Eurozone. The same promise was delivered in November with no substantial measures. Many economists expected real action in the form of the US QE. Even the Bank of Japan started its own QE program. Even though the Euro area economy is not in deflation, prices are falling constantly damaging companies’ revenues and raising unemployment. Real measures are expected on the December meeting. Canadian employment data: Friday, 13:30. Canada’s job market unexpectedly increased by 43,100 positions in October, pushing unemployment rate down to a nearly six-year low of 6.5%. Analysts expected a contraction of 5,000 jobs following September’s gain of 74,100 positions. The jobless rate, declined from 6.8% in September, to the lowest since November 2008, suggesting the labor market is regaining strength. The labor participation rate, stayed at 66%, the lowest since November 2001. Full-time jobs increased by 26,500, while part-time positions increased by 16,500. Canada’s job market is expected to add 5,300 jobs while the unemployment rate is predicted to reach 6.6%. US Non-Farm Employment Change and Unemployment rate: Friday, 13:30. The US job market gained fewer than expected positions in October adding 214,000, but the Unemployment rate declined to its lowest level since 2008 reaching 5.8%. However, despite the forecast of 235,000 job addition, October’s gain is still considered positive. Wage growth remained sluggish, as wages increased 0.1% month-on-month, missing expectations for growth of 0.2%. Year-over-year, wages grew 2%, below expectations for a 2.1% gain. US job gain in November is expected to be 225,000, while the unemployment rate is predicted to remain unchanged at 5.8%. Like the US equities, the US Dollar reached to for a fresh high to close out this past week. In fact, the Dow Jones FXCM Dollar Index (ticker= USDollar) pushed to a fresh five-and-a-half year high and in doing so crossed the mid-point of its historical range at 11,350. While there are multiple fonts of potential Greenback support that can extend this run, the most important avenues are presenting an uneven drive. Between the currency’s role as a safe haven, its performance relative to its major counterparts and the outlook for its better potential returns; we may soon need a changing of the guard for its most prominent node of bullish appeal. Otherwise, flagging potential from its most successful sources of return may soon fall apart. Of the three areas of fundamental support for the Dollar over the past months, the most substantial contribution to the climb has been the relative depreciation of currencies like the Euro, Pound, Yen and Yuan. These currencies have been weighed by a downshift in growth, a loosening of monetary policy and the reduction in expected returns that results from both of those elements. Strength or weakness is always relative, so the United States’ position as a comparatively robust expansion and the Fed’s persistence towards normalizing its own policy effectively built the perceived premium. Yet, how far can the US’s performance deviate from a global trend? Global growth forecasts have degraded significantly as of late. Recently, the OECD warned that the Eurozone’s economic troubles posed the greatest threat to the global economy. Meanwhile, China – which has seen its growth pace steadily and purposefully cool – is expected to lower its target even further to 7 percent. In these circumstances, it is obvious that the capital will be drawn to the US; but can the world’s largest economy continue to run far off the pace of the global trend when the connections of performance are so interconnected? Historically, the correlation between US and World GDP is strong and positive. In fact, its current 12-month rolling correlation is 0.70 (strong and positive). Therefore, the longer and broader the global struggle, the more likely it hits the US. Relative growth is a long-term driver, but monetary policy – which has been the key FX driver as of late – may also start to close the Dollar’s gap. Easing efforts by the Bank of Japan, European Central Bank and People’s Bank of China (the interest rate cut and end of repos) are pressing the bounds of policy options. All have in one form or another have admitted to limitations of policy in some forum, and some have taken steps to pull out of the nose dive – the BoJ is starting to express concern about the Yen depreciation and the PBoC has vowed to avoid a credit bubble. This coming week, the ECB will debate on whether to take perhaps the final, big-step policy differentiator in its arsenal (QE with government bond purchases), but it is more likely to come in 1Q 2015. Meanwhile, the Dollar’s own separation from the pack via monetary policy may be reaching its near-term limitations. Until the market can close its disparate view for the timing and pace of rate hikes to that of the Fed or the Primary Dealers, premium will start to waver. And, this past week, 2-year break-even rates – a gauge of market-based inflation expectations – hit four year lows. It will be difficult to ramp Fed-based rate expectations materially given global and domestic headwinds. Meanwhile, it also difficult unlikely that the United States’ global counterparts will continue to weaken materially while the country itself remains unaffected. That leaves one extraordinary and untapped fundamental outlet: risk trends. Assets with a ‘risk’ sensitivity are diverging more prominently, references to exposure and growth are growing more common, and a collapse from oil this past week sowed unease. Should unwinding turn into a need for a liquidity, the Dollar will tap into an as-yet unutilized fuel. The markets continue to seem relatively sanguine in their outlook on Japanese domestic developments with the December 14 snap election drawing closer (as we discussed last week). That is likely to keep external factors at the forefront in the near term, with seasonal considerations becoming ever more important as the looming end of the calendar year alters capital flows. While risk appetite flourished in 2014, investors are almost certainly questioning that trend’s continuity in the year ahead as consensus forecasts calling for some degree of Fed stimulus withdrawal become increasingly entrenched. That may fuel a desire to book profits on risk-sensitive exposure as the year-end holiday cycle gets underway, securing yearly performance numbers ahead of what might be tougher times ahead. In the FX space such, this translates into liquidation of carry trades, many of which are financed in terms of the perennially low-yielding Japanese unit. A broad unwinding this exposure would translate into a wave of short-covering on anti-Yen positions, putting substantial upward pressure on the currency. Thin inter-holiday liquidity conditions may amplify volatility, making for particularly sharp moves against prevalent trends and vaulting JPY swiftly higher from recently-established six-year lows. US economic news-flow may likewise encourage this dynamic. A slew of high-profile releases are due to cross the wires including manufacturing- and service-sector ISM figures, the Fed’s Beige Book survey of regional economic conditions, and the always intensely followed US Employment report. Outcome expectations point to improvements in most areas (albeit with some soft spots). If these prove robust, this may fuel speculation that Janet Yellen and company will move faster to lift rates than is currently priced in, encouraging the push toward liquidation and accelerating Yen gains. The British Pound finished lower for the sixth-consecutive trading week versus the US Dollar, and a busy week of economic event risk ahead points to GBP volatility and potential losses. GBP traders will turn attention to the upcoming Bank of England Interest Rate Decision for any surprises, while broader market volatility seems likely on a European Central Bank meeting as well as the monthly US Nonfarm Payrolls labor data release. The BoE seems unlikely to announce any policy changes at their upcoming meeting, and indeed this is a major reason why the British Pound continues to underperform versus major counterparts. It was in the late summer that a strong wave of UK economic data boosted forecasts for the future of domestic interest rates; the Bank of England seemed likely to raise rates before most G10 counterparts. Yet it was only this week that analysts pushed BoE interest rate forecasts to the third quarter of 2015—lagging behind the US Federal Reserve and other major central banks. Given that the Bank of England does not release a detailed statement on unchaged policy, GBP traders will likely look to the ECB rate decision and US Nonfarm Payrolls to drive moves across Sterling pairs. The European Central Bank meeting could spark important moves in EUR pairs, and the British currency could move in kind via the EUR/GBP. Risks arguably remain to the topside for the EUR ahead of the event as ECB President Mario Draghi is unlikely to announce fresh easing at the coming meeting. Even downgraded BoE policy forecasts leave the Sterling at an advantage, however. The EUR/GBP will likely remain under pressure as the ECB is likely to keep interest rates lower for longer. Interest rate differentials will remain in focus on Friday’s US NFPs release as the future of US Federal Reserve monetary policy remains in the balance. Any especially strong labor market data prints could send the US Dollar to fresh highs versus the Sterling and other majors. And yet we would argue that risks remain to the downside as the Greenback surges to fresh peaks across the board. Long-term seasonality studies suggest that currencies will often set monthly lows/highs at the beginning and end of the month, and the first week of December could see important currency moves ahead of year-end. 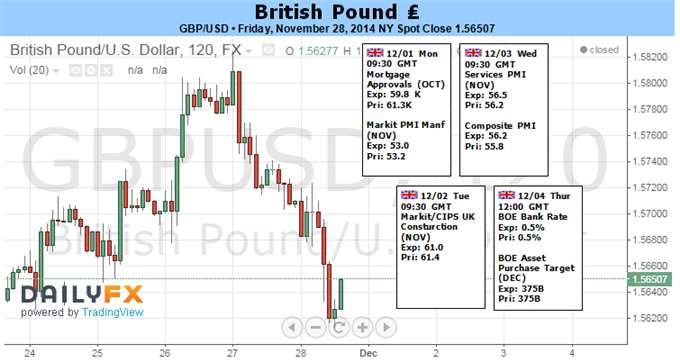 We will keep a close eye on key data to judge the likelihood of a lasting GBP reversal. 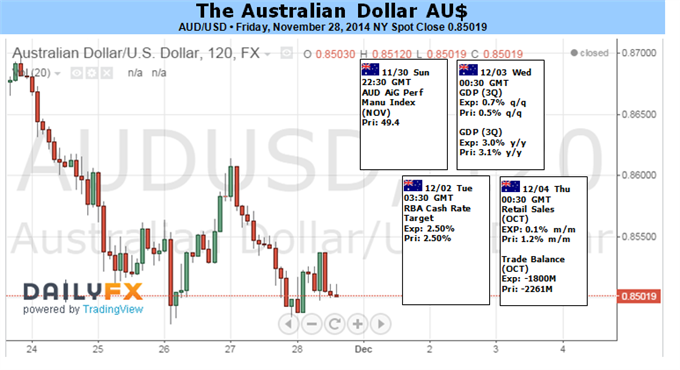 The Australian Dollar plunged to a fresh 2014 low against its US counterpart during the week as volatility levels rose and its yield advantage detiorated. A light local economic docket left the Aussie with little guidance, yet the RBA’s Lowe delivered the currency a blow when he suggested the door was open to further rate cuts. Additional pressure was potentially put on the pair by a significant slump for some of Australia’s key export commodities. Looking ahead; the first week of December is littered with top-tier domestic data as well as the last RBA decision for the year. On balance local data has softened and this trend may prevail with upcoming trade balance, retail sales and building approvals data. However economists’ expectations point to a relatively robust third quarter growth reading of 3.1 percent year-on-year for the Australian economy. At this stage it would likely take a more material deterioration in local economic data over an extended period to catalyze a change in the RBA’s rhetoric within their policy statement. This suggests that for the time-being another status-quo Statement could prevail at the final meeting for the year. This in turn could leave the AUD to take its cues from elsewhere. Heightened implied volatility levels in the FX market remain a significant threat to the AUD. The CVIX measure jumped to a 2014 high over the past week – indicating traders are pricing in some significant movements amongst the major currencies over the near-term. As noted in recent reports such expectations bode ill for the high-yielding currencies like the Aussie. This threat has been amplified by a deterioration in the AUD’s relative yield advantage against its major counterparts. This includes a slide in the Aussie 10 year bond yield spread to Treasuries to its lowest since 2006. The S&P 500 did very little during the Thanksgiving week, as we failed to hang onto the gains. By doing so, we ended up forming a shooting star, which tells us that the market is ready to pull back a little bit. That being the case, the market looks as if it is running out of steam a little bit, and that’s okay because we realize that it’s only a matter time before the market pulls back and looks for buyers. We believe those moves will be buying opportunities as the S&P should go to the 2100 level. The silver markets initially tried to rally during the course of the week, but ended up falling rather precipitously. However, there are plenty of buyers just below so we need to see a couple of hammers from previous weeks get broken down below. In other words, we need to see a move below the $15 level, and as a result we would be sellers at that point in time. We have no interest in buying, because this market is so negative and the US dollar is so strong at the moment. Gold markets fell during the course of the week, slamming into the hammers that we had shown as support recently because of that, we feel that this market will probably continue to attract buyers, but we need to see whether or not we can break down below the bottom of these hammers. Because we do it will be a continuation of the downtrend and we should at that point in time had to the $1000 handle. However, if we continue to see support in this area we could get more of a bounce. Ultimately, we prefer selling gold given a chance, especially considering how strong the US dollar is. The USD/JPY pair initially fell during the course of the week, but found enough support to turn things back around and form a hammer. This is a market that is without a doubt positive, and we have no interest in selling it. We believe that the 115 level is now the support level of that keeps the market afloat, and that pullbacks all the way down to that area can be bought. However, we are a little bit parabolic at this point in time, so we would love to see some type of pullback in order to take advantage of value. 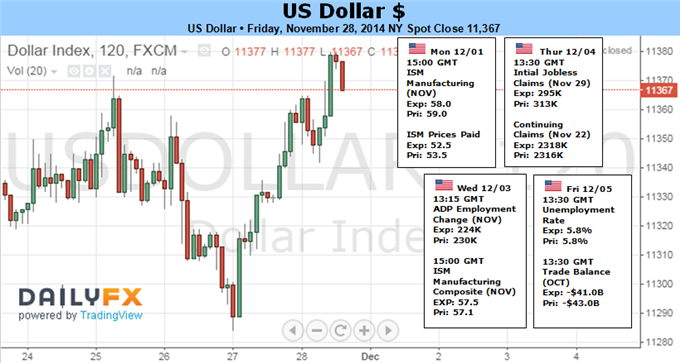 The USD/CAD pair rose during the course of the week, using the 1.12 level as support. Because of that, it feels as if the market is ready finally break out, and if we can break above the recent highs we would anticipate the 1.15 level been tested and broken to the upside. Pullbacks continue to be buying opportunities but keep in mind that this pair tends to be very choppy over the longer term, although it does trend a long time as well. With that being the case, you have to be patient trading this pair.